Can I tell you how excited I was to be asked to do a review of Tessa Huff’s new book Layered? Like, pacing the kitchen and waiting for the UPS guy to arrive excited. 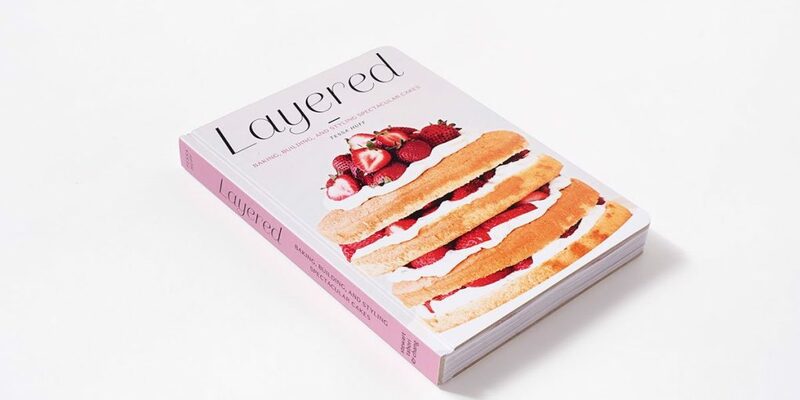 I mean, asking me, lover of all things sweet, to review a gorgeous new book about layer cakes, and then bake one of the to-die-for looking recipes and flaunt it to my friends? Yes, oh yes, I’m in! Whenever I receive a new cookbook, I usually read it cover to cover. I love all of the tips and tricks that the author has to offer, as well as the stories about how recipes come to pass. I knew as soon as I began reading through this book that Tessa and I were kindred spirits. If you’ve been following me for a while, you know about my love for Swiss Meringue Buttercream. I mean, as a bake shop owner myself, I do believe this icing is one of the best to work with. It truly is a silky, smooth icing, that is a dream to flavor and tint. Tessa must adore it too, and each of her flavor combinations had me more excited about my next cake adventure and I couldn’t wait to get into the kitchen to experiment! I was instantly drawn to the Golden Champagne Celebration Cake, a tall, yet stylish cake, with edible gold scattered on top. Tessa explains that this cake may just be the perfect way to ring in the New Year. While I do wholeheartedly agree with that, I also say, let’s not wait that long! I think it would be a gorgeous addition to a shower table, an anniversary celebration, even as an elegant cutting cake at a wedding. Here’s the part that’ll really knock your socks off….This is totally doable. It has easy to follow directions for the novice baker, and new ideas and tips for those who are a little more comfortable in the kitchen. The cake itself is a rich cake, full of egg yolks and vanilla bean seeds and bakes up the lightest layers because of the simple butter/sugar creaming method. The cake batter was intoxicating. The smell of it was incredible, and I couldn’t wait to get it in the oven. The icing was a dream, and having worked with it many times before, I was thrilled with the addition of Champagne. I have to say, I was very pleasantly surprised by the icing flavor. It was slightly sweet, with just a hint of that bubbly Champagne (and there was Champagne left over, so this was win/win all around). Because I didn’t have gold flakes, I used gold and metallic sprinkles and sugar pearls as suggested. I was thrilled with the results to say the least. The taste and presentation were out of this world. In a word, mouthwatering. This would be stunning on any dessert table. Friends, I have to say, you need this book. You need it for dessert for your next barbecue. It’s a must for your next birthday celebration cake. Your upcoming family gathering won’t be the same without it. It will earn its place, displayed on your kitchen shelves with all of your favourites. And to help get this layer cake party started, I’m giving away a copy!